For various projects, my friends or I have needed to amplify a standard K type thermocouple to the 10mV/C ideally suited for computer and microcontroller based analog-to-digital converts. This amplification is critical, because the thermocouple by itself only puts out 41 μV/C, which is TINY. Additionally, thermocouples operate by measuring the temperature difference between two points, so you need to know the temperature on the "cold" end of the thermocouple as well. Traditionally, this was done by submerging the cold end in a bucket of ice water, but that's a lot of work and becomes messy, so the preferred method is to use some sort of electronic compensator such as Linear's LT1025. 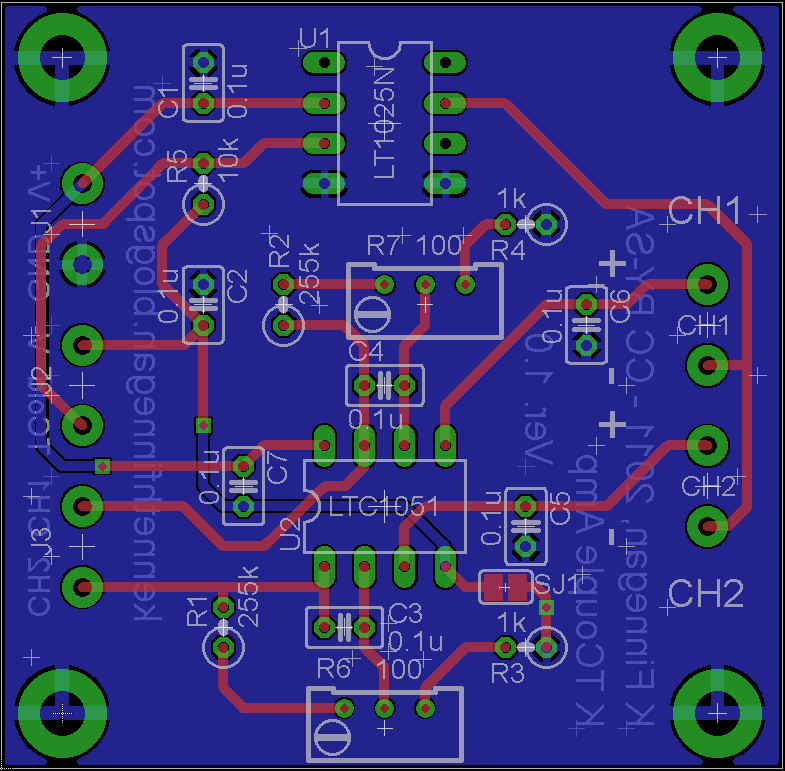 I have previously built the reference application from the LT1025 datasheet, but now that I've finally taught myself how to use Eagle, I decided reimplementing it on a printed circuit board might be useful in the future. V+: Something like 5V. As long as the power supply provides a clean voltage larger than the output you need, the exact numbers don't explicitly matter. The maximum voltage between V+ and V- is a function of the dual op-amp you use. V-: This can be shorted to ground through SJ1 if you don't need to measure temperatures below 10C, otherwise apply something like -5V. Tcold: This is a 10mV/C signal of the cold junction reference on the circuit board. Useful if you also want to measure the ambient temperature. If you expect the ambient temperature to be below 0C, you will need to install a 10k resistor in R5, which is otherwise unneeded. CH1: 10mV/C signal of the first thermocouple to be fed into a volt meter or ADC. CH2: 10mV/C signal of the second thermocouple, also to be somehow measured. The right connector is for the two K type thermocouples. The polarity is important! Make sure you get the positive wires in the positive terminals, which are marked in the silk screen. I expect the thermocouples to be terminated with bare wire, so if they come ending in HPC connectors or otherwise, you just need to get a screw driver and disassemble those. 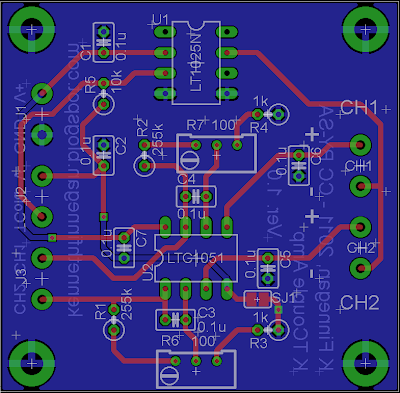 I used ITead Studio's prototype PCB service, which is a very interesting service. $14 out the door got me 10 copies of my sub-5cm x5cm board, and two random other boards of other person's design. They're decent boards... There is definitely some problems with drilling accuracy, but it doesn't look like any of the holes are too problematically off-center. If you're planning on using this service for a board design, I suggest pushing all your masks out a few more mil than you really need for through-hole. Unfortunately, I don't currently have access to my electronics work bench, so I can't assemble one of these boards yet to see if it actually works.I'm certainly not going to need ten copies of it, so if you want to be adventurous and try testing it for me, I'll mail you one of the boards to play with. If you would like to make any changes, or use this design in a larger project, or just have boards fabricated yourself, the entire design is licensed CC BY-SA, noting that the original schematic is heavily based on Linear's datasheet application note. Download the Eagle/Gerber files here. I got the board today. Thanks! I have a few more things to add to my Digikey order which I'm hoping to finalize this weekend. So I should be able to build up your board sometime in the next week. I got one of your boards with my ITead order today. Very nice. And like you said, kind of fun to see what great surprises you get from others! @Jon: That last board is an inertial measurement unit (I only notice because my summer job involves evaluating those right now). I can't trace out the pinouts in my head from the pictures, but I've seen accelerometers (like the MMA7455) in that LGA14 package, and I'd bet there's a gyro that fits on that rather unique landing on the left. Too bad they didn't at least give you orientation dots to start from. BTW, I tried just sending this as an email, but I couldn't find/get to an email address for you on your site. Thanks Kenneth! I'll take another look at that board and see if I can make sense of it now. I want to download the gerber/eagle files but the link and mirror are both dead! Anywhere else I could get the files, or perhaps you have a board laying around?